I read blogs for years before I decided to start Money Manifesto. I wish I would have started sooner. Unfortunately, the idea of starting a blog was very overwhelming for me. I had no clue how to start. If you want to start your own blog, don’t put it off. I recommend using a self-hosted WordPress blog with SiteGround. I’ve put together this guide to help you get through the initial steps of getting your self-hosted WordPress blog up and running with SiteGround. 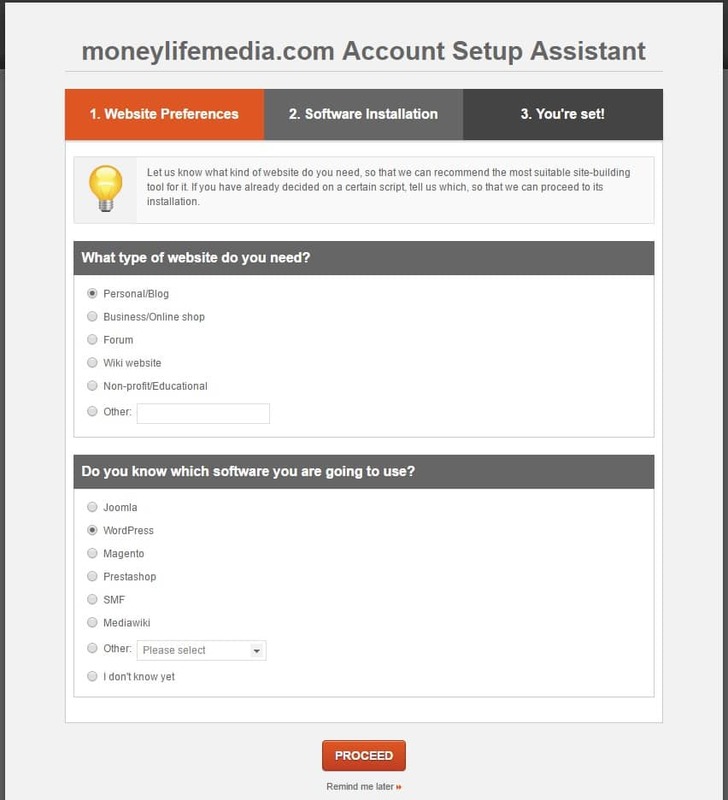 Follow the screenshots below step by step and you’ll be ready to get started blogging today. Your domain name is what you type into the address bar to visit a website. For instance, Google’s domain name is Google.com. My domain name is MoneyManifesto.com. Personally, I recommend registering your domain name with NameCheap. NameCheap may cost a little more for the first year’s registration, but renewing your domain each year afterward is usually cheaper with NameCheap. They also have great customer service, unlike some big domain sellers such as GoDaddy. While I personally would choose a .com name, you can purchase other extensions such as .biz, .org and .net if you’d rather. Keep in mind, most people expect to type in .com to visit your website. 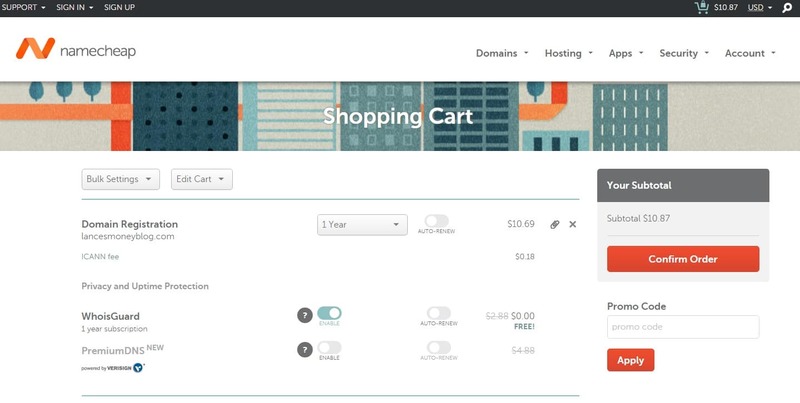 First, you’ll want to visit NameCheap and make sure your domain name is available by using their search feature. Next, you’ll add the .com or other version of your domain you’d like to purchase by clicking the shopping cart with a plus sign on it. Then click view cart on the right side of the image below. 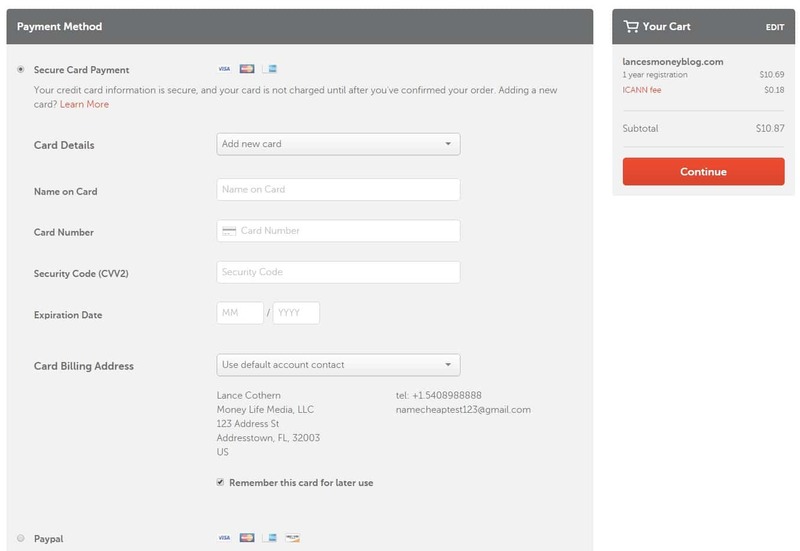 Once you’re at your shopping cart, you’ll have the option to register your website for 1 or more years. 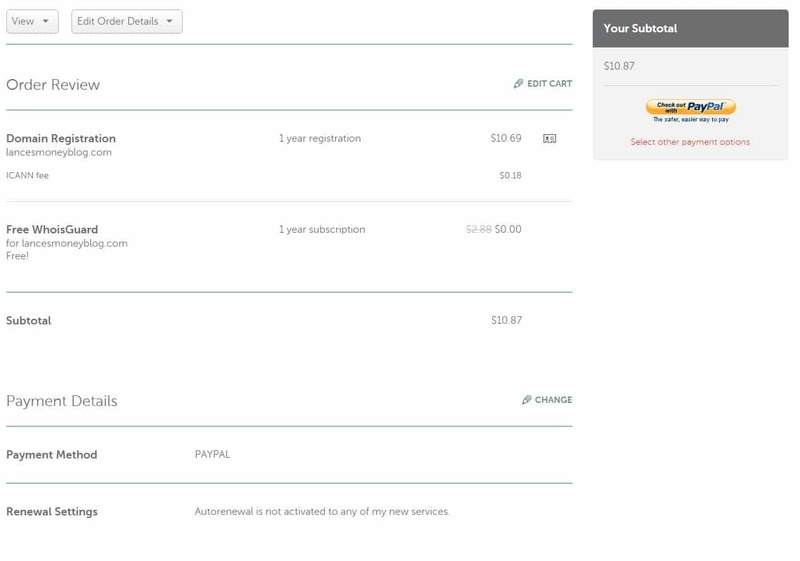 You can also turn on Auto-Renew, which I recommend to make sure you never forget to renew your website. You get a free 1 year subscription of WhoisGuard, which protects your contact information from the general public when you register a domain with NameCheap. Once you have everything as you want it, click Confirm Order as seen on the right side of the picture below. 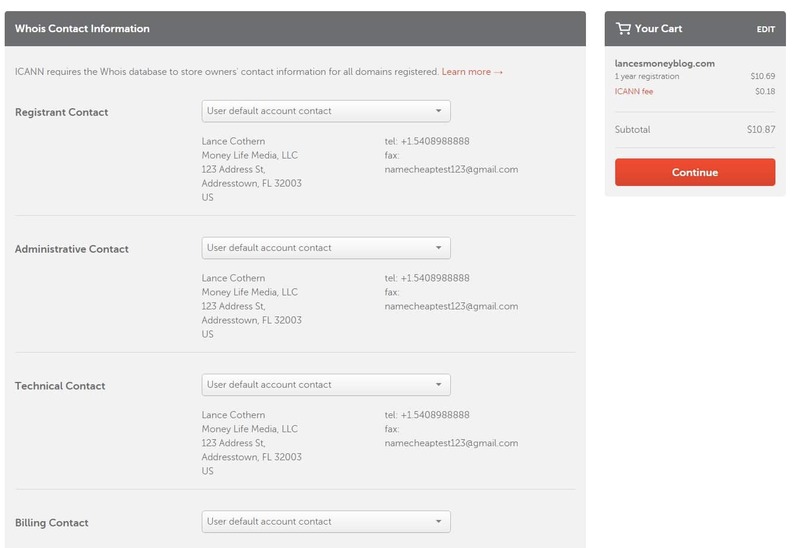 You’ll have to create a NameCheap account to manage your domain and complete your purchase. 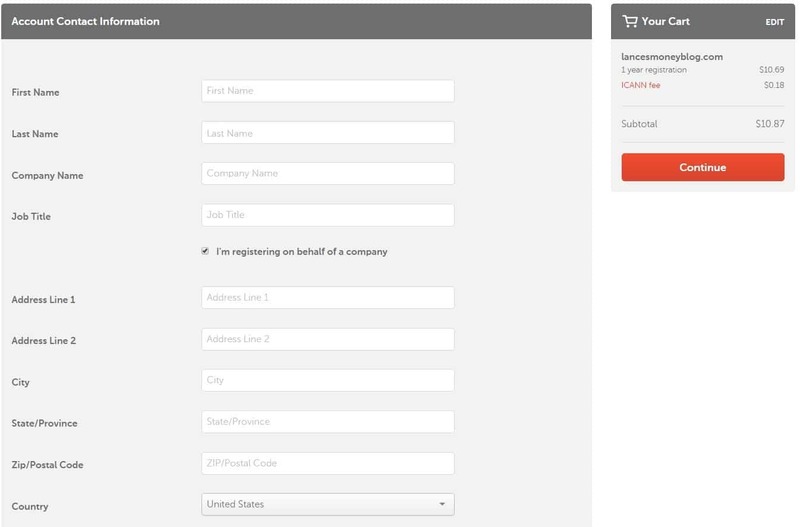 Fill out the requested fields and click Create Account and Continue on the bottom right side of the image below. Next, you’ll have to enter your contact information. This is required for any website registration company. Once you’re done, click Continue on the right side of the image below. The next step involves filling out your Whois Contact information. This is required by all website registering companies. You can either use the information you entered earlier or change it at this step. Once you’re done, click Continue on the right side of the image. We’re almost done registering your domain name. Now just enter your payment information and click Continue on the right side of the screen when you’re done. Finally, verify your order is correct before finalizing your purchase. I chose PayPal as my payment method so I would click the yellow PayPal button on the right side of the screen. If you pay via another method, you’d finish your purchase by clicking on the orange button in the same place. Congratulations! You officially own your domain name. Now it’s time to purchase hosting so you can put your website on the internet. When it comes to hosting, you have many options. Personally, I suggest SiteGround thanks to their great customer support as well as a grade A product and decent price. With SiteGround, your site won’t go down as often as on many other shared hosting platforms. If you follow other bloggers, you may see them recommending BlueHost. Unfortunately, BlueHost has gone downhill over the last couple years. The websites BlueHost hosts go down more often than they should and their customer support is awful. It takes forever to get a hold of a representative and even once you do, they may not know how to help. So why do other bloggers recommend BlueHost? First, they have great name recognition. BlueHost spends a ton of money on advertising so people know their name. Second, BlueHost has a very lucrative referral program that allows bloggers to make more money than many other hosting providers. I’d rather make a little less money and refer my readers to a service I trust like SiteGround than make a little extra money and have my readers second guess my recommendation when their new blog goes down. Yes, BlueHost is a little cheaper up front, but you get what you pay for. For just a little bit more, you can have a site on SiteGround that will give you some peace of mind and won’t cause you any major headaches. 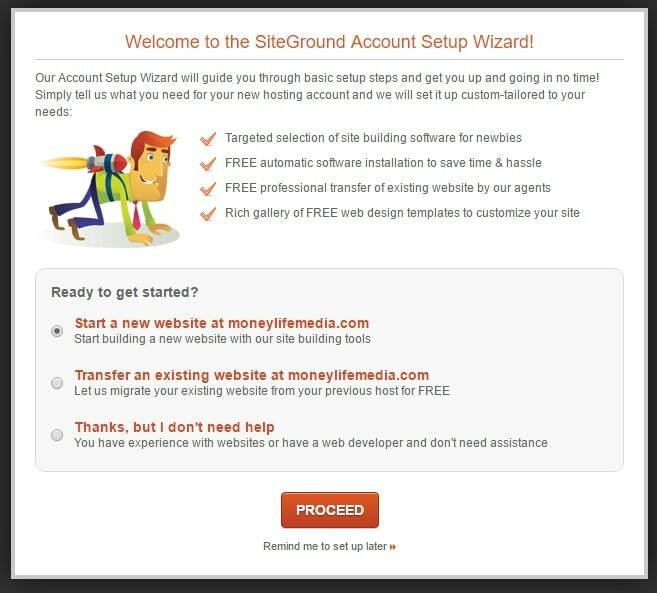 To get started, you’ll need to visit SiteGround and pick a hosting plan. Your host, SiteGround, gives you three options to pick from, all at 60% off their regular price. The image below shows you your options. Personally, I recommend the StartUp plan for new bloggers that only plan to have one site. 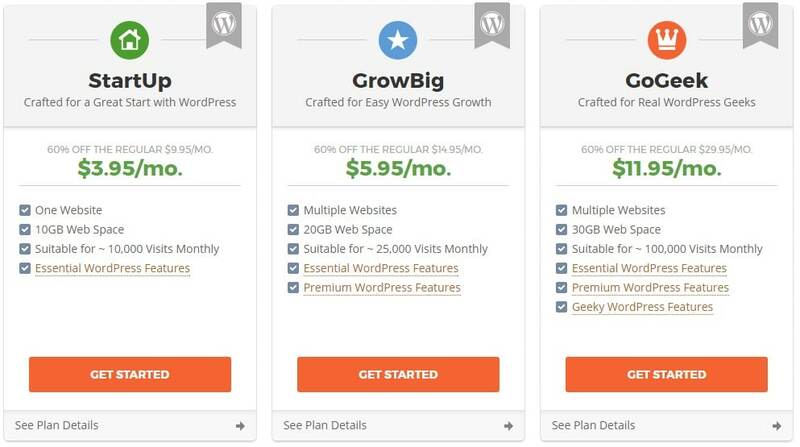 If you want to have multiple websites, you should pick the GrowBig plan. No matter which plan you choose, make sure you lock in the introductory hosting pricing of 60% off for at least a year. You can even lock in the introductory pricing for up to three years if you wish. After your initial package expires, the rates will increase to the regular prices shown, which is still a bargain for the level of service you’ll receive from SiteGround. Please Enter Your Domain: Select I already have a Domain. www. : Enter your domain name. Account Information: Input your email address and create a strong password. Client Information: Input your contact information as requested. Payment Information: Input your payment method. Purchase Information – Hosting Services – Plan: Make sure the plan you selected is shown. Data Center: Leave the data center as SiteGround has pre-populated it. Period: Select how many months you’d like to lock in the 60% off price for. I recommend at least 12 months, but you can choose 24 or 36 months, too. You must pay for all discounted months up front. Extra Services – SG Site Scanner: I do not recommend purchasing SG Site Scanner. You can unclick the checkmark if you do not wish to purchase it. Congratulations! After you click Pay Now, you officially have hosting for your website. Now that you’re self-hosted, it’s time to connect your domain name to your hosting so your website will show up on the internet. Now that you own a domain name and a hosting package, you need to connect both of them so your website shows up on the internet. It sounds complicated, but it is easy if you follow these quick steps. First, log in to your SiteGround account. Click on the My Accounts tab on the top of the page. Find Nameservers under the Account DNS line as seen in the image below. There should be two listed for your hosting account. After you find your nameservers, you’ll need to input that information in your NameCheap account. 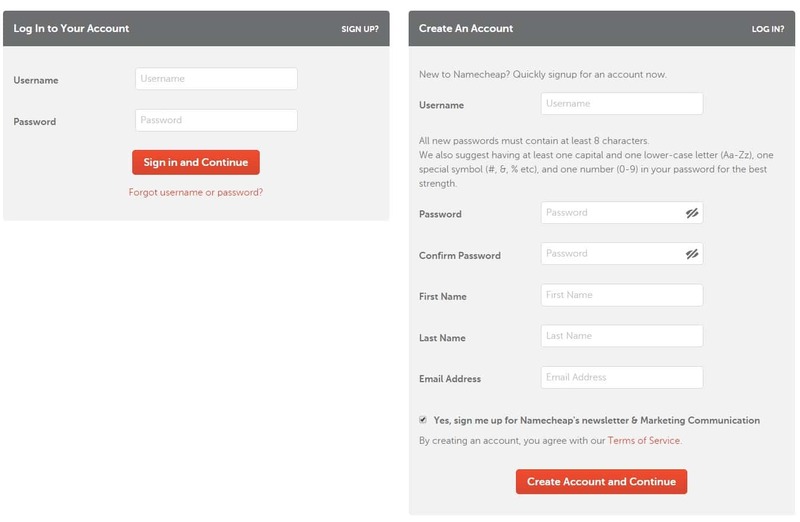 Next, log in to your NameCheap account. Once you’re at your dashboard, find the domain name you want to use in the list of Recently Active in Your Account as seen below. 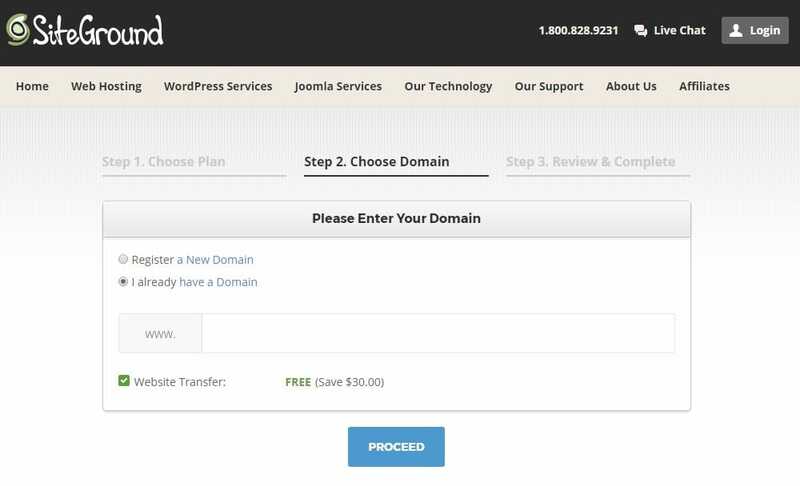 Then click the Manage button to the right of the domain. You’ll now see the screen below. Scroll down to the section labeled NAMESERVERS on the left hand side. To the right of the ?, select Custom DNS. Now input the two Nameservers based on the information you found in your SiteGround account. Click the green checkmark to the right of Custom DNS to complete this step. Congratulations. People can now find your website when they type your domain name into their address bar. That said, sometimes it takes up to 48 hours for the internet to catch up. If your website isn’t displaying right away, wait 48 hours before contacting NameCheap customer service for help. Installing WordPress is pretty easy, but can be overwhelming if you don’t know what you’re doing. 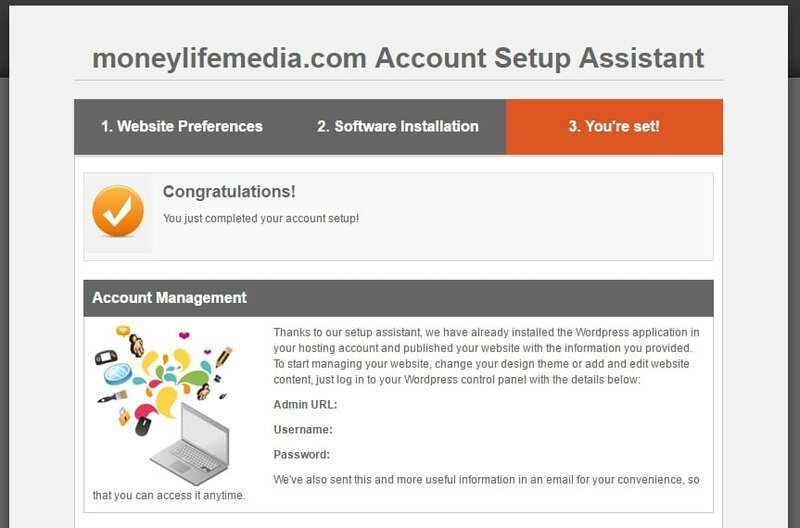 Here is exactly what you need to do to get WordPress installed on your new site. Log in to your SiteGround account. If you aren’t already on the home tab, click home. Select “Start a new website at YourDomain.com” then click PROCEED. Under “What type of website do you need?” select “Personal/Blog”. Under “Do you know which software you are going to use?” select WordPress. 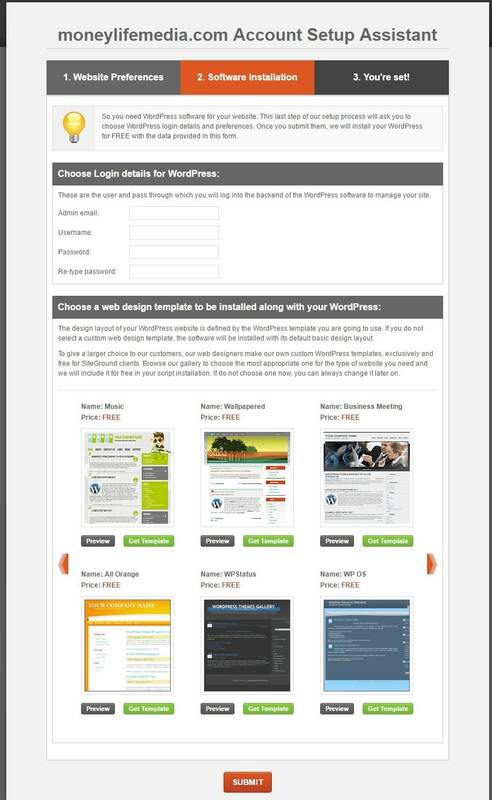 Now it’s time to choose your login details for WordPress. Use the image below for reference. Under “Choose Login details for WordPress:” enter the following. Admin Email: Choose the email address you’d like administrative emails sent to. Username: Pick a unique username only you will know. A unique username will cut down the likelihood of someone being able to hack your site down the road. Password: Please choose the strongest password possible. This will help prevent hackers from gaining access to your site. Re-type Password: Re-type your password to make sure you input it correctly. Under “Choose a web design template to be installed along with your WordPress:” you can select a free theme for you website or skip this section to install the default WordPress theme. Congratulations! You have installed WordPress and should see the following image. Write down the important information listed including Admin URL, Username and Password. Congratulations! Everything is now ready to start your blogging experience. Here are a few things you may want to do to get started on your blogging journey. The first thing you’ll want to do is log in to your WordPress admin area. You can log in to your WordPress site by visiting http://www.YourDomain.com/wp-login.php. Simply enter your admin username and password and you’ll be in. A theme is what makes your WordPress blog look how it looks. Personally, I suggest picking a free theme to get started. I wouldn’t spend too much time on picking a theme, because you’ll want to change it in a few months when you have a better idea of what you’re blogging about and how you want your blog to look. Instead, focus on more productive activities that will help you to grow your blog. Writing posts is the main point of blogging. You need to write to inspire, entertain or teach others. Without a few posts on your website, people won’t know whether they want to stick around to keep reading in the future or leave. Here’s how you can start writing your first post. Once logged in to your site, you should see a menu on the left side of your screen. You should see a “Post” in the menu list. Hover over that to see a drop down of options. Click “Add New” to start writing your first post. Plugins are ways to enhance your site’s functionality without the need to know how to write the code to do a task yourself. Here are a few plugins I recommend everyone should have. Akismet Anti-Spam – This plug-in helps reduce spammy comments on your site. Believe it or not, some people have computers comment on any website they can to get attention for their sites. EWWW Image Optimizer – This plug-in optimizes your images when you upload them to help your website load faster for visitors. Limit Login Attempts – This plug-in will block anyone who tries to enter an incorrect password multiple times on your site. It helps keep hackers out. Yoast SEO – This plug in will help you with Search Engine Optimization (SEO) when you’re ready to tackle it. Until then, just install it so search engines can more easily find your site. To add plug-ins, hover over the “Plugins” menu item and click “Add New”. On the top right of the next page is a search box. Search for the plug-in you want to install. Then, click “Install Now” to install each plug-in. Part of blogging is promoting your writing. While I wouldn’t get too hung up on the promoting part yet, it is important to claim your accounts on popular social media sites. Consider claiming accounts for the following services at a minimum. You don’t have to do anything with these accounts yet and you never may. However, claiming your name makes sure someone else won’t steal them before you get started. Hopefully this guide showing you how to start a self-hosted WordPress blog with SiteGround has helped you get started. Now it’s up to you. After all, it is your blog. Let me know how it goes. I’d love to check out your blog. If you have any questions at all, please feel free to Contact Me or leave a comment below. I’ll answer as best as I can.